Whooga are widely considered to be one of the fastest-growing Ugg boot brands – thanks in no small part to their competitive pricing and quality materials. I took delivery of a pair of their (now discontinued) weave style Ugg boots a couple of months ago. I have to say that I’m not a massive fan of Ugg styling in general and I was curious to see if my sensibilities would fare better with a weave style boot and whether or not these boots would actually live up to some of the hype surrounding them from independent reviewers. Firstly, the brand need to work on some packaging issues. My box arrived so badly tattered that I couldn’t store the boots in them. If I had been giving them as a gift, they would have been an instant return for this reason. I have read other reports of Whooga boots arriving in bashed packaging and of course, Royal Mail need to take some blame for this but I believe that a double layer of bubble-wrap would go a long way to protecting the corners of the box against this problem. On the flip-side, I can’t fault the speed of delivery and we all know that when we buy something online, we want it like, yesterday! When you first take them out of the box, they have a distinctive smell of glue. It’s really a little off-putting and ultimately, it makes them smell quite cheap. Chinese factory cheap. You know what I’m saying. Leave them in a place to air for a couple of days and this smell thankfully disperses. A thorough inspection of all the seams, joins and nooks and crannies reveals no obvious manufacturing flaws, everything is in sound condition and neatly stitched/glued/constructed. I have an EU size 40 and I’m a UK 6.5 – these are sadly slightly too big. Definitely go for a size down. No arguments. As a virgin Ugg boot wearer, I really wasn’t sure how I would fare with these on my feet. They are indecently snug and haven’t left my feet since the weather changed for the colder on Saturday but I will be buying a pair of quality sheepskin insoles to put in them because I feel the foot-bed is a little hard. This may also help solve the sizing issue. The knitted weave styling is more to my taste and I feel works far better with dresses than the usual Ugg style but I won’t elaborate too much on this, seeing as they’re sadly no longer available to purchase. I will say however that these really hug my calves beautifully (when pulled up) with no sagging or over-stretching and I feel that this is testament to the quality of the manufacturing. Ultimately, get your sizing right and I believe that for the price, these Ugg boots from Whooga would be difficult to beat. Other than a slightly hard foot-bed and a bashed box, I can’t actually pick fault with them – they feel well-supported and solidly-constructed with quality, authentic materials. Ooo~ pretty! and for a good price too. 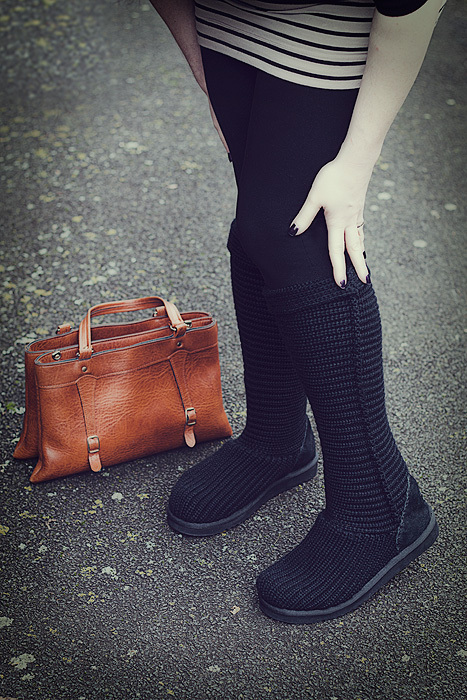 I absolutely love uggs and like charlotte practically live in them throughout the autumn and winter months. I managed to snag a pair of UGG autralia classic cardys (similar to charlotte’s knitted weave style) in grey for £60 (RRP £135) on mandmdirect.com last year. Ka-Ching! I’m not sure whether they be doing a sale like that again but its worth keeping an eye out on the website. Its been a whole year and the soles still look brand new, so definately worth the investment if you can afford the big pricetag. It’s warm and comfy but like Whooga, i do suggest going a size down. I’ve just looked on Whooga and the chocolate short ugg boots are looking at me. Looks like im going to get myself an early xmas present. From a girl who has never appreciated the Ugg style and felt repulsed by some of the outfits put together with those boots, these are actually cute! I wouldn’t buy them myself, but I would rather look at these styled up than the original any day! I also love the beige one. Ooh, this sounds like it might be a good brand for me. I really can’t bring myself to buy a proper pair of Uggs but most of the cheaper alternatives don’t maintain their shape and look like slippers very quickly. Thank you so much for the review as I hadn’t heard of Whooga before. The boots are nice and everything, but tell me more about your bag! I love it! ahh thank you, it’s a charity shop find though and doesn’t have any labels on it! 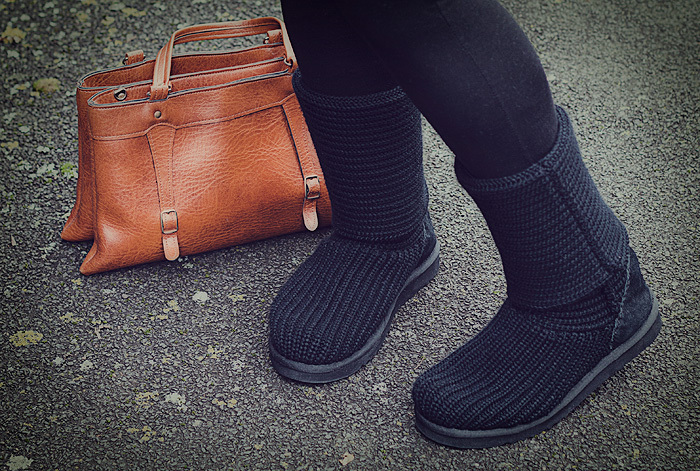 These look really nice on you – definitely a more acceptable Ugg! I’m so tempted to buy Uggs this year (tardy to the party, I know) and I’d looked at Whooga boots, but tbh the price difference was negligable and I think if I’m going to shell out for casual sloppy boots I’d rather get the UGGs. These do look cute though. AWOOOOGA! I wouldn’t be able to wear these for that reason, I think my other half would bash my head in because I would just be saying ‘AWOOGA!’ over and over! A warning if you need to return a pair of boots. I had to return a pair (which had been sent to replace an original order which had been mislaid by the transport company after three weeks of me waiting)The boots were a different style and I could not get them on my feet. Whooga asked me to return them by registered post & to provide a tracking number which I did. The cost for this was €18 which they would not reimburse – it would have been better for me to keep them & sell them on Ebay!! The reason for not reimbursing me was to avoid money laundering – pretty sad if you have to try & moneylaunder €18! !